Ryan Reynolds doesn’t have time to answer your email, but his out of office reply totally makes sending one worth it. The Deadpool actor was on a talk show recently to plug his alcohol brand Aviation Gin and made the amazing mistake of sharing his work email address with the universe. Unsurprisingly, he’s been pretty slammed with messages and it’s gotten to the point where he’s had to turn on an out of office responder that tells you exactly where he is at all times in the week – plus pokes a lot of loving fun at his wife Blake Lively and their children. He revealed on The Tonight Show With Jimmy Fallon that his email was ryan@aviationgin.com and said that if you shot him an email, ‘you get a response back at least’. 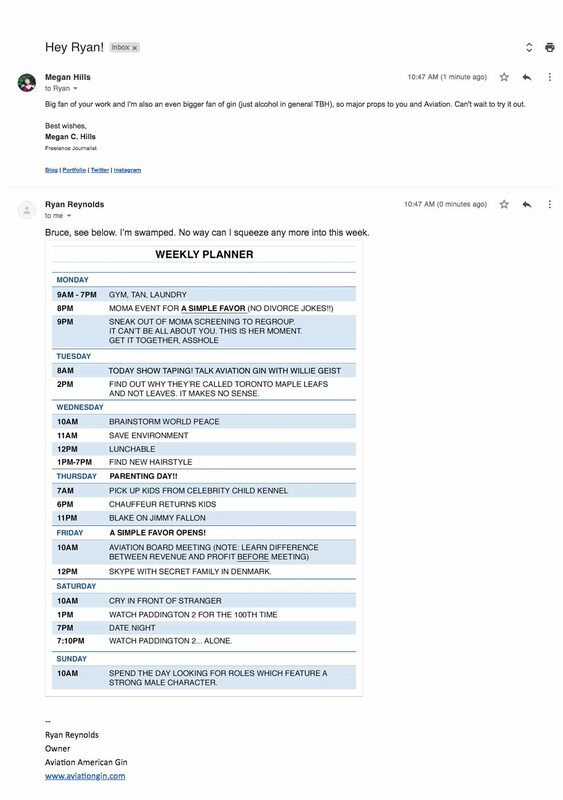 I tried it out and got a pretty instantaneous response with a detailed breakdown of his week’s schedule, which you can see below. He then attached an image of his schedule, which included dropping off his kids at the ‘celebrity child kennel’, making time to cry in front of strangers, deal with a secret second family and a reminder to make ‘no divorce jokes’. He also snuck in a reference to her own appearance on Jimmy Fallon on Thursday evening, as well as a more charming date night on Saturday at 7pm – though he didn’t divulge what it would involve. All we know is that it lasted ten minutes and that he would be watching Paddington 2 immediately afterwards, ‘alone’. His trademark wry sense of humour was apparent throughout, as he dropped in little quips like a plan to ‘skype with secret family in Denmark’ and ‘spend the day looking for roles which feature a strong male character’ – a dig at Hollywood’s oversaturation of powerful roles for men, but not all that many for women. Like his anti-hero Deadpool, he also dropped in a pop culture reference (the first ‘gym, tan, laundry’ is a reference to a reality TV show called Jersey Shore) and harkened back to his Canadian roots with a shout out to the Toronto Maple Leafs, one of their national ice hockey teams. Aviation gin is something of a recent venture for Ryan Reynolds, who explained in the interview he’d fallen in love with it after going back to the same cocktail bar several times to have ‘the best negroni’. He later discovered it was made with Aviation Gin and bought his way into the business as an owner, which he seems to be loving if him chugging a neat gin on the Fallon show is any indication. Another reason why he decided to invest in Aviation Gin? Well, it had a little something to do with his family. Cheers to that, Ryan. We can’t wait to grab a bottle for ourselves. The post Ryan Reynold’s out of office email makes hilarious jabs at his and Blake Lively’s marriage appeared first on Marie Claire.